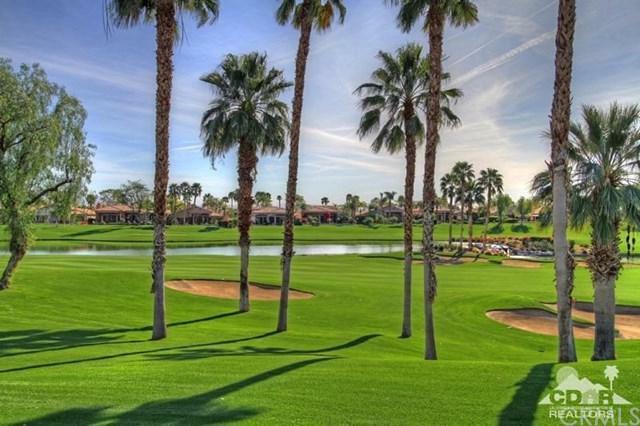 One of a kind Montana 3 estate featuring spectacular southeast views of the Santa Rosa mountains, double fairways (holes 11 & 12 Pate) waterfalls and lakes being leased turn key furnished---truly one of the best locations in the development. Splendid courtyard entrance includes a private detached casita and beveled glass double door entry leading into the grand foyer. Inside you'll appreciate all the custom designer features and amenities including a desirable open floor plan, gourmet chef's kitchen, multiple custom built-ins, formal dining area and private office/room with built-ins and bar area. The large luxurious master suite provides an over-sized walk-in closet, fireplace and spectacular views. Mature landscaping complements recently renovated decking, pebble tech designer pool/spa, custom BBQ area with seating, custom fire-pit and stunning 180 degree views perfect for family gatherings and entertaining that simply cannot be matched in the desert.